1 baby Table Queen Squash, steamed, scoop out the middle and mash well. 10 baby potatoes peeled, steamed. Add 2 Tblsp butter and crush gently. Sprinkle with Robertson Roast Potato Seasoning. 2 chicken breasts washed and dried well. Sprinkle with Robertsons Portugues Chicken spice. Heat a pan and add 2 Tblsp butter and sear the chicken in the butter. Serve with the Squash mash, crushed potatoes and steamed vegetables of choice. 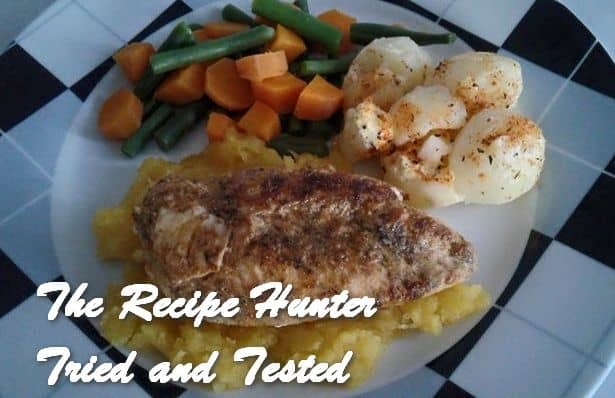 This was a very simple dish, light, easy, quick and healthy. And of course yummylicious. Cooking can be very simple made into a fancy dish.